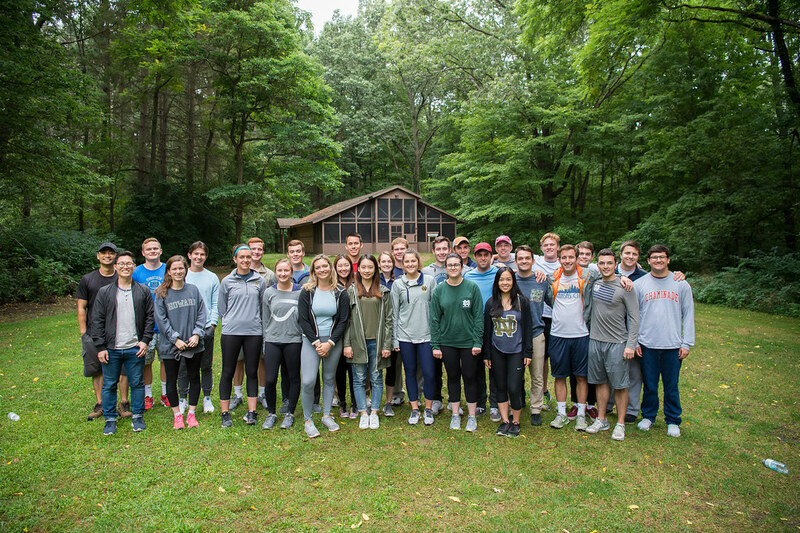 On August 18 and 19, Notre Dame Institute for Global Investing’s Investment Management Leaders attended an overnight retreat at Pretty Lake in Mattawan, Mich., where they participated in team building activities including a high ropes course. The students began the retreat with ice-breaker team activities and also broke up into smaller groups to focus on fostering both verbal and physical communication skills. Junior Liam Bryson said he sharpened his leadership abilities over the weekend. Junior Bernie Grant agreed, saying that at Pretty Lake she discovered the importance of listening to others and being collaborative in the investing field. “I think a big emphasis on the retreat was learning how to determine when to lead and when to follow, and identifying the right opportunities to step up for your team,” Grant said. Following a group lunch, the students participated in a high ropes course with a partner. Towering 30 feet in the air, they climbed around on ropes and walked across shaky platforms, learning to rely on each other in a high-pressure situation. To close the day, the students attended a casual campfire where they had the opportunity to relax and talk with each other. They discussed their summer experiences as well as future career goals. Bryson said hearing about other students’ plans helped him to learn about fields he hasn’t experienced himself. NDIGI director Kevin Burke said one of the targeted learning experiences on the retreat was having the students discover more about their own strengths and weaknesses. Grant said the most valuable thing to come out of her experience as an NDIGI Investment Management Leader thus far has been the connections she has made with people important to shaping her future.